Great quad core performance, amazing OC potential and the stock cooler to (mostly) keep up with it while looking halfway decent. Ryzen Master software is great too. Single gripe is that it has pins on the bottom instead of a flat plate like Intel, mine had a couple bent pins I had to bend back. According to my research, I wasn't super lucky in the silicon lottery, but I managed to hit 3.88ghz at 1.34v on the stock cooler without breaking 76c under full synthetic load! Works great, we achieved a modest overclock with the silent stock cooler. I was originally going to get a Ryzen 5 1600, but if I did so, I could only really afford a gtx 1050ti, which I was originally going to do. However, doing more research led me to believe that upgrading my GPU and downgrading my CPU would be more beneficial in most games that I planned to play. Honestly I haven't even overclocked my R3 1200 and its doing absolutely fine in every game I've thrown at it (granted the GPU really helps). I get no lag or stutter in the Star Wars Battlefront 2 beta on ultra settings in 1080p! This chip might not blow your socks off, but that's OK, because you're not going to buy a 'budget' chip if that's what you're looking for. What it does do is run a very healthy overclock with its supplied Wraith cooler (and a B350 motherboard and fast RAM); and this works really, really well for gaming at 1080p, 60Hz. I have a nice, factory OC'd GTX 1060 and from what I can gather, neither component is bottle-necking the other. Great! Obviously, if you want or need more, you're going to spend more for more grunt. But for what I'm doing, this is a very fine option. It's may not be blowing my socks off, but it's definitely massaging my feet in a way that makes me feel all tingly and happy! Quad core, unlocked, great stock cooler, cheap price, what more could you ask? Loving the Ryzen, got it to 3.8GHz quite effortlessly. from completed build One Year Update: First time builder - Patience pays off. 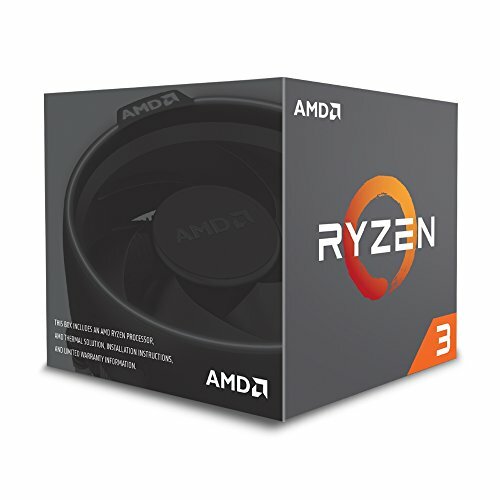 CPU: AMD - Ryzen 3 1200 3.1GHz Quad-Core Processor I started this build thinking I was going to get the Intel Pentium G4560 in the $60 range, but then they became more expensive than the G4600, then the Ryzen 3s came out. The overclocking ability is what sold me. I can turn a 1200 into 1300X speeds. I have it running at 3.1GHz now, but I plan on a mild overclock to the 3.6 range. I couldn't find a sale on these, so I paid full price. Overclocked to 4.0GHz at 1.3125V using the stock cooler reaching low 80c under 100% CPU usage. Scored a 606 on Cinebench R15. The reason I chose a Ryzen 1200, is for starters the price, it was relatively cheap but had great performance for most mid to high setting's on games. For the price to performance I can't really argue with it.